My mom used to make my siblings and me write in a journal about our daily activities, and because it was something that was forced upon me, I really did not like it it. At least initially I didn’t. A few journal entries in, I decided to stage a rebellion. I made a mockery of the activity by devoting four pages to clumsily articulating my love for eggs. I was in the 2nd grade at the time, so it went something like this: I love eggs. Eggs are good. I love to eat eggs. And so on. My protest was a huge failure. My mom read the entry, and I was enrolled into Kumon’s after-school reading and writing program a week later. I am sure all the writing I did as a little girl influenced my love for blogging. So I guess what I’m trying to say is … thanks mom and sorry I was such a pain! Mama choi not only helped me find and grow my love for rambling on paper, but she also thoroughly educated me on Vietnamese cuisine. I have professed my love for Vietnamese cuisine before, and I’ll do it again. 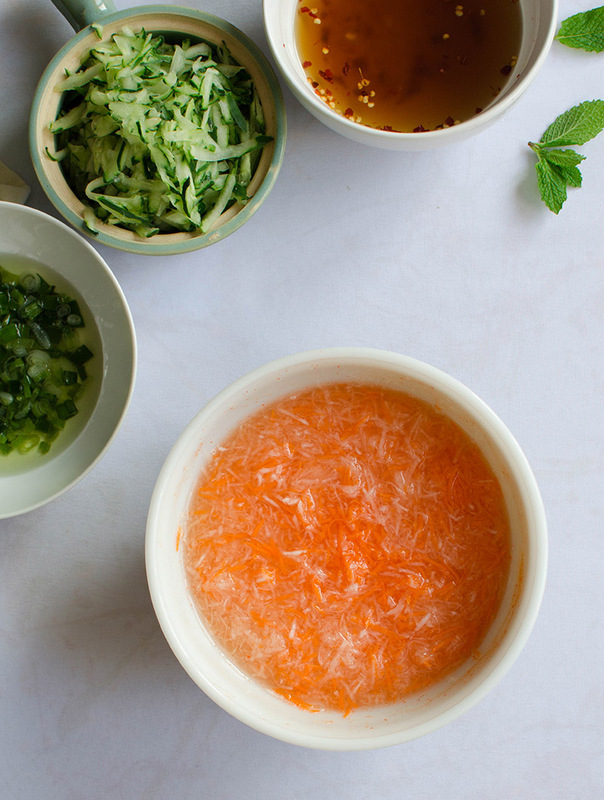 There is nothing like the art of Vietnamese cooking, which has some French blood running through its veins. The abundant use of fresh herbs and the pungent, perfect sauces make my knees weak. 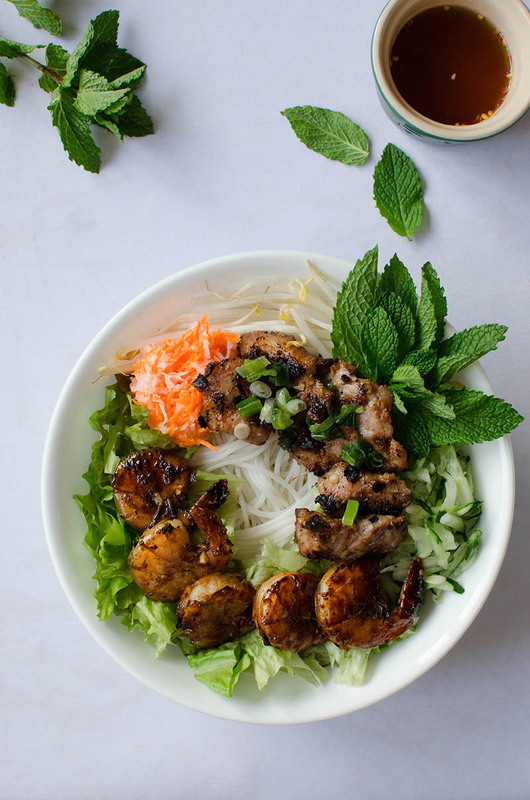 This brings me to one of my favorite dishes ever: bun thit nuong, or vermicelli with grilled meat. 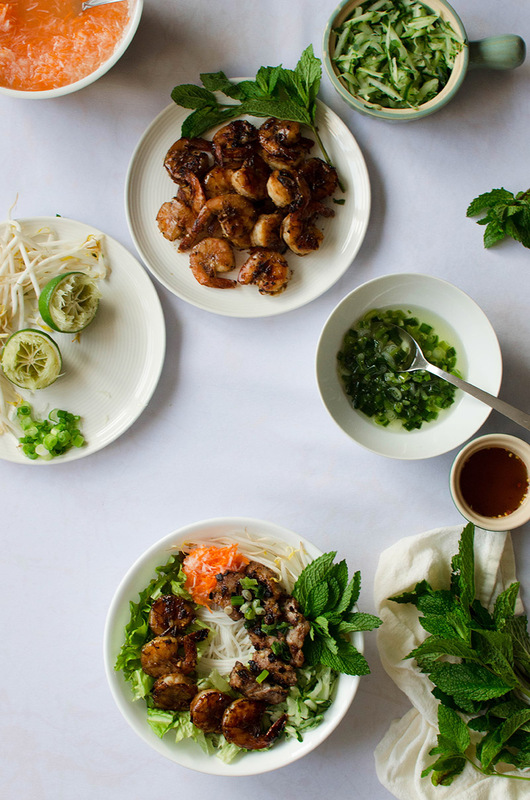 This dish, a melting pot for fantastic Vietnamese flavors and an enormous variety textures, is absolutely stunning. 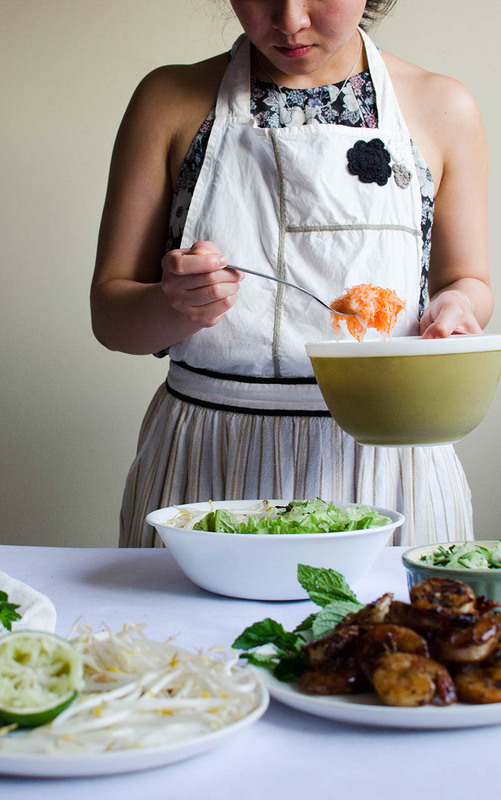 Sitting in a large bowl, soft rice vermicelli noodles are topped with crisp lettuce, bean sprouts, and fresh mint. Then pickled carrots and daikon and freshly grated cucumbers are added to the bowl. 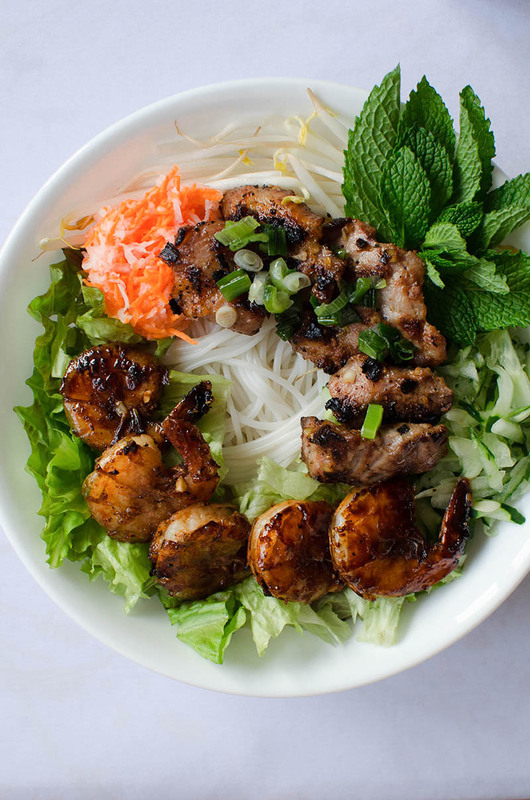 Perfectly grilled lemongrass pork and shrimp are placed on top of everything. Finally scallion oil and the nuoc mam cham sauce are drizzled over the bowl. I eat this by mixing everything up in the bowl so that the savory flavors of the meats, the vinegary carrots & daikon, the coolness of the cucumbers, the crispy greens and bean sprouts, and of course, the oniony oil and sauce all come together for the perfect bite. It is a true masterpiece. There are many renditions of this dish, and I am here to contribute another one to the world. Like a good chocolate chip cookie recipe, I strongly believe you can never have too many. Restaurants will serve this with roasted peanuts on top, but I never preferred that taste in savory foods. If you’re against me, go ahead and throw some crushed peanuts on top. At first glance, the ingredients list may look daunting, but you’ll see that the same couple of ingredients are recycled throughout the recipe. There is more prep work than anything else, however it’s all very simple – I promise! Of all the lovely summer fare, this cold noodle bowl is something I could indulge in every day between the solstices. In a large bowl, combine all the ingredients, except the pork, then whisk to combine. Add the pork, then cover with plastic wrap. 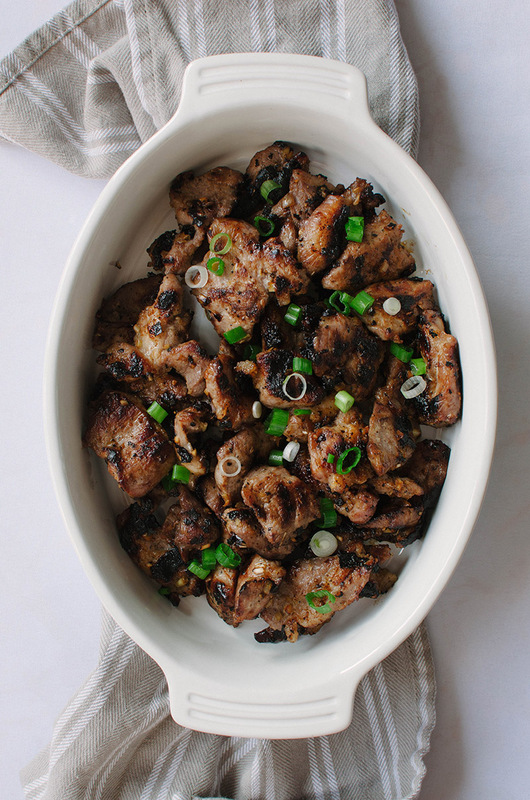 Allow the porkto marinade for one hour in the refrigerator. Heat a grill pan over medium heat to medium-high heat. Place the meat on the grill and cook for 3-4 on each side, until completely cooked through. Plate, then set aside. In a large bowl, combine all the ingredients, except the shrimp, then whisk to combine. Add the shrimp, then cover with plastic wrap. 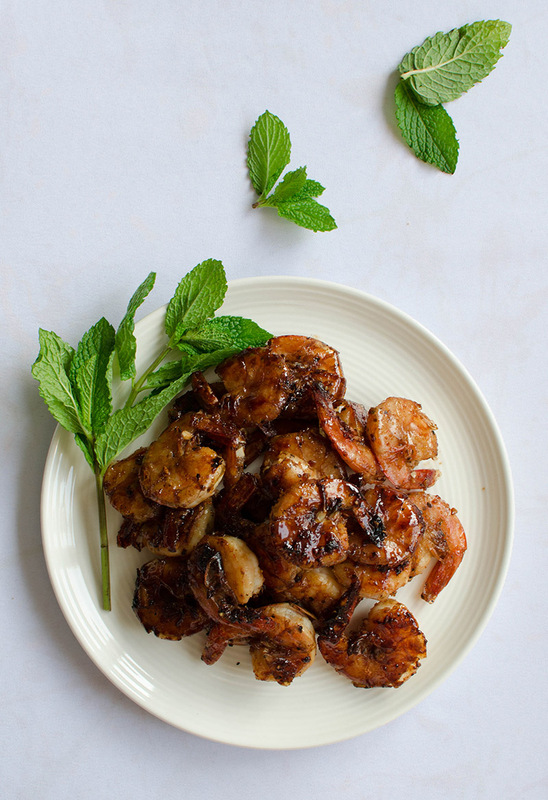 Allow the shrimp to marinade for one hour in the refrigerator. Heat a (clean) grill pan over medium-high heat. Using tongs, place the shrimp on the grill. Cook each side for about 2-3 minutes. Plate, then set aside. Place the carrots and daikon in a medium bowl. Add the salt and sugar. Pour in the vinegar, then stir to combine. Cover with plastic wrap, then refrigerate for one hour (it will keep for at least one month). In a small skillet, heat the oil over medium heat. Add the scallions and salt, then stir to combine. Cook and occasionally stir for 4-5 minutes, until the scallions are soft. 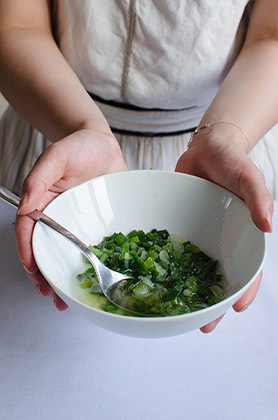 Transfer the scallions and the oil to a bowl, then set aside. In a small sauce pan, heat the water and sugar over medium heat until the sugar dissolves to make a simple syrup. 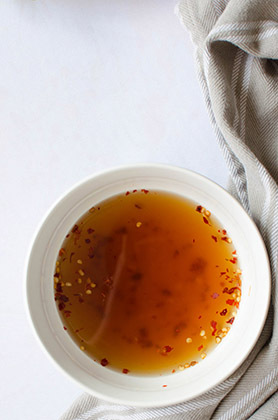 Pour the simple syrup into a bowl, then stir in the remaining ingredients. Set aside. Bring a large pot of water to boil, then add the noodles. Cook using the instructions on the package until they're al dente, usually about 9 minutes. Rinse the noodles with cold water, then divide into four or six large bowls. Top the noodles with lettuce, mint leaves, bean sprouts, grated cucumber, pork, shrimp, and pickled carrots and daikon to your liking. 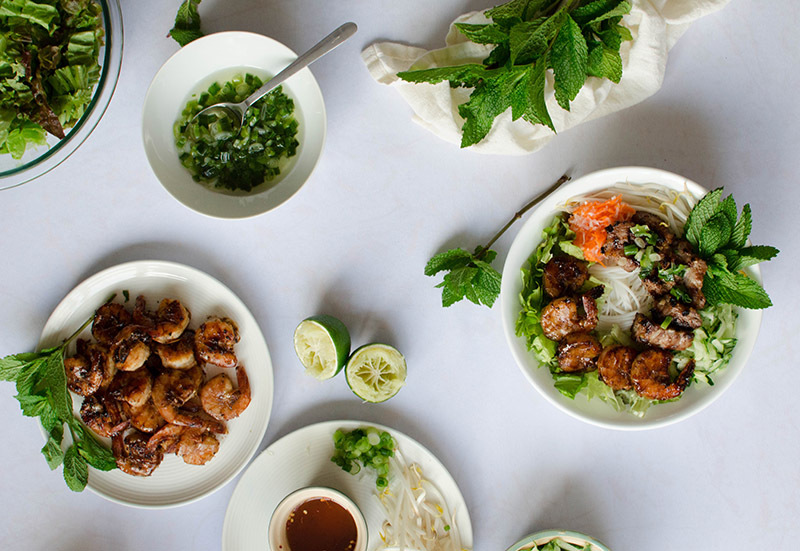 Drizzle some scallion oil over the pork and shrimp, then drizzle some nuoc mam cham over the entire bowl. Cook only as many noodles as you want to immediately eat. Everything else can be stored in the refrigerator as leftovers, but noodles are much better freshly cooked. 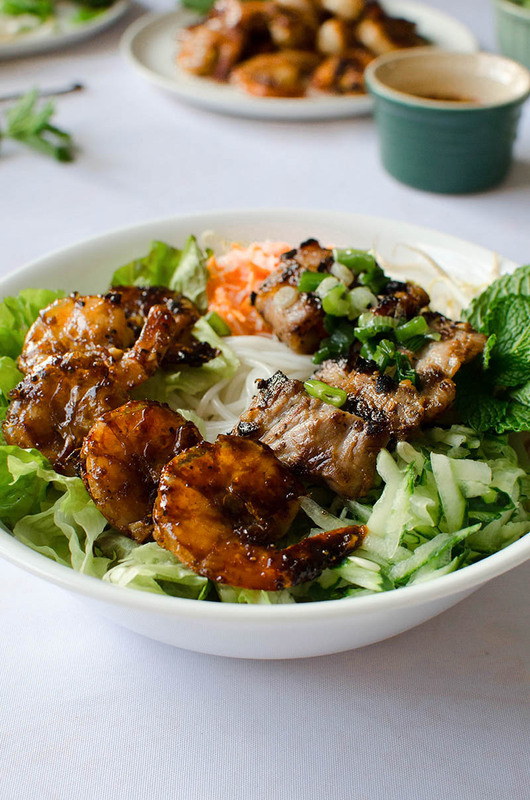 This entry was posted in Entrees and tagged bean sprouts, carrots, cucumber, daikon, fish sauce, lemongrass, mint, nuoc mam, pickled, pork, read leaf lettuce, rice noodles, scallions, shrimp, soy sauce, vermicelli, Vietnamese. Yum! I’m dying for a bowl of this!! It’s the kind of food that makes me happy. In my book, the best kind of pork is Vietnamese grilled pork. I’m sure the Pho we eat is nothing like the original one, but I have to eat it at least once a week or every 2 weeks. (had some yesterday :P) It’s so addicting and one of those dishes that whet your appetite no matter how you’re feeling–hence, my biggest craving when I was pregnant, haha. And vermicelli bowls are a close 2nd because they’re so clean and filling at the same time. Made this last night, and just wanted to say thanks for a wonderful recipe! As a part Chinese/Vietnamese gal, I’ve made this a few times in the past and ate this all the time growing up at restaurants, and this is one of the best recipes I’ve found. Super happy with the results and this will be my go to recipe in the future. 🙂 Thanks for sharing and keep up the good work!